Jewish Home central committee approves deal securing technical bloc with Otzma Yehudit. PM calls to congratulate Jewish Home chairman. 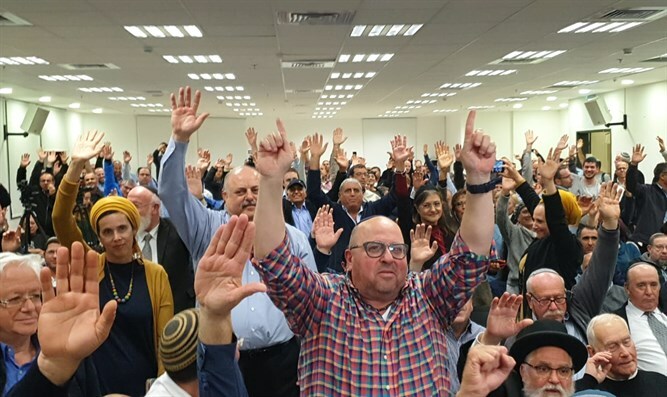 The Jewish Home party's central committee approved Wednesday evening the unification agreement with the Otzma Yehudit faction. The approval came at the end of a tense meeting which included calls against committee members and Knesset candidates. Prime Minister Netanyahu later called to congratulate Jewish Home Chairman Rabbi Rafi Peretz. According to the deal, Otzma Yehudit will receive the fifth and eighth seats in the unified bloc of the Jewish Home and National Union. Following the elections the parties will split and operate independently. Prime Minister Binyamin Netanyahu and the Chairman of the Jewish Home Party, Rabbi Rafi Peretz, met earlier today to discuss the conditions for an alliance between Otzma Yehudit and the Jewish Home-National Union. As part of the agreement, the Jewish Home-National Union faction will receive two significant ministerial positions, with the two sides already talking about the education portfolio. In addition, Prime Minister Netanyahu promised to secure the 28th place on the Likud list for a representative of the Jewish Home-National Union, and after the elections the representative would be transferred to the united party. Netanyahu also agreed to enact the expanded 'Norwegian Law,' which would allow additional representatives from the list to serve as Knesset members. The two also agreed during the election campaign that the parties would not attack each other but would strengthen each other to secure a right-wing victory. Prime Minister Netanyahu said at the end of the meeting that "the next elections are between a left-wing government headed by Lapid and Gantz and a right-wing government headed by me. I congratulate the representatives of the Jewish Home and the National Union for their responsibility for the Land of Israel that caused their success in uniting the ranks to ensure that the voices of the right are not lost."